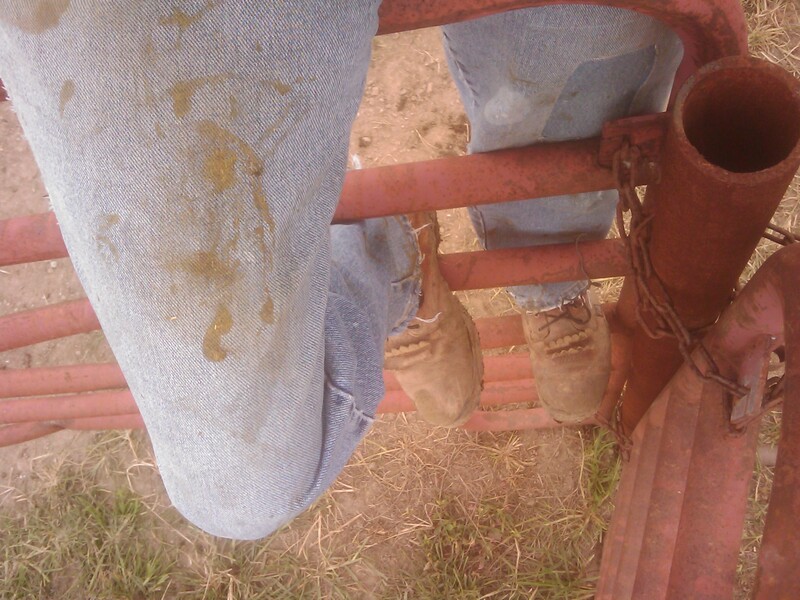 Hey That’s My Hand…Dang Cow…Life At The Chute! Don’t you just shake your head when the darndest unexpected things happen! 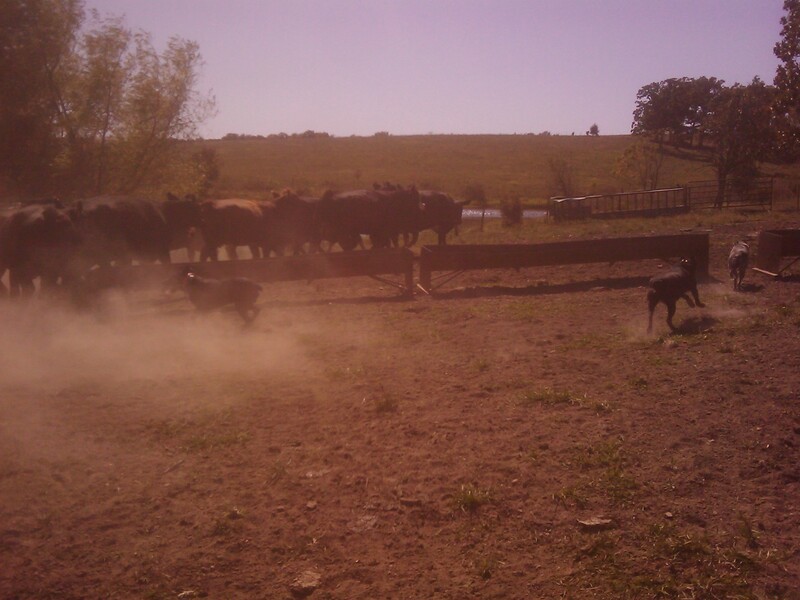 Today I took 8 cowdogs to go work cattle. 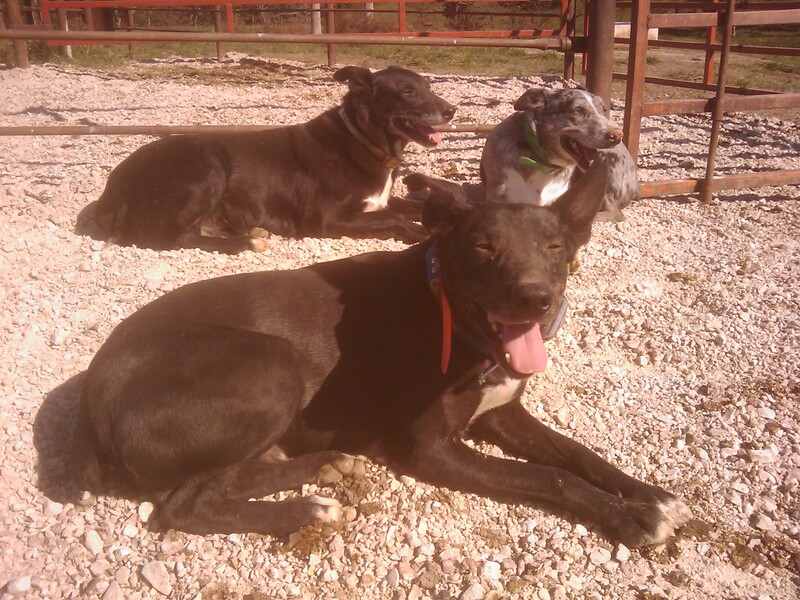 Three cowdogs to run the pens, load the alley and push the cows into the chute. Five youngsters were left on the pickup to watch and learn to watch and not run their mouths. Everything went extremely well until we started the second group of cows. First cow in the chute decided she didn’t want the new eartag or having her headed tied to the side. And, she was successful in hitting the rope so hard that she pulled just enough slack to whack my hand against the head gate handle. 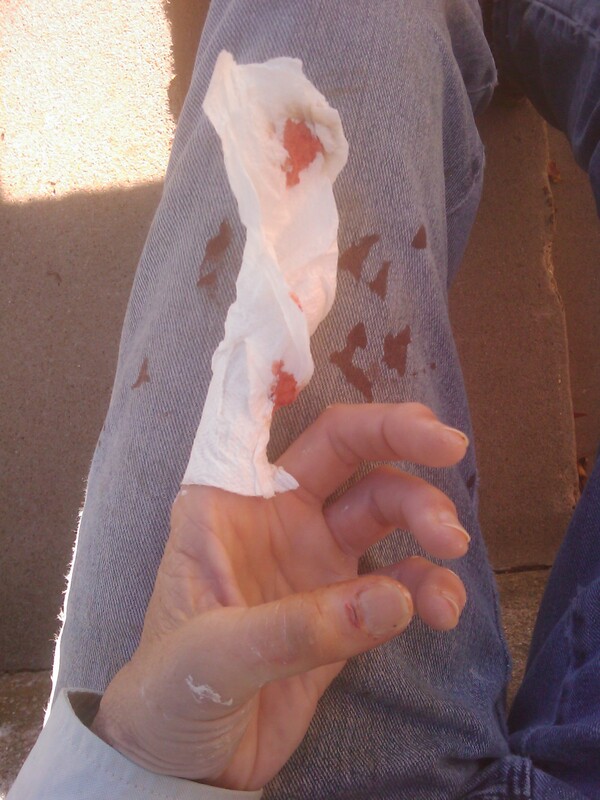 Good thing I had my handy-dandy Geier gloves on or it would have been worse! It sure hurt. My first thought was to get my glove off to survey the damage. There was a cut on the underneath side of my index finger. It just didn’t want to stop bleeding so I thought I’d just tape it up and go on. Well, good idea…but no tape. Looking in my vet box I didn’t find the usual roll of Co-Flex wrap. I didn’t want to drive home and waste away an hour…so there I was, wondering what to do. The only thing I had were paper towels and latex gloves. So I wrapped a towel around my finger and eased a latex glove over my hand and wiggled my glove back on my hand, and got back to work. We all know in times like these that sometimes you just keep going, get done and deal with the details later…after all, the longer you piddle around, the faster the soreness and stiffness sets in. 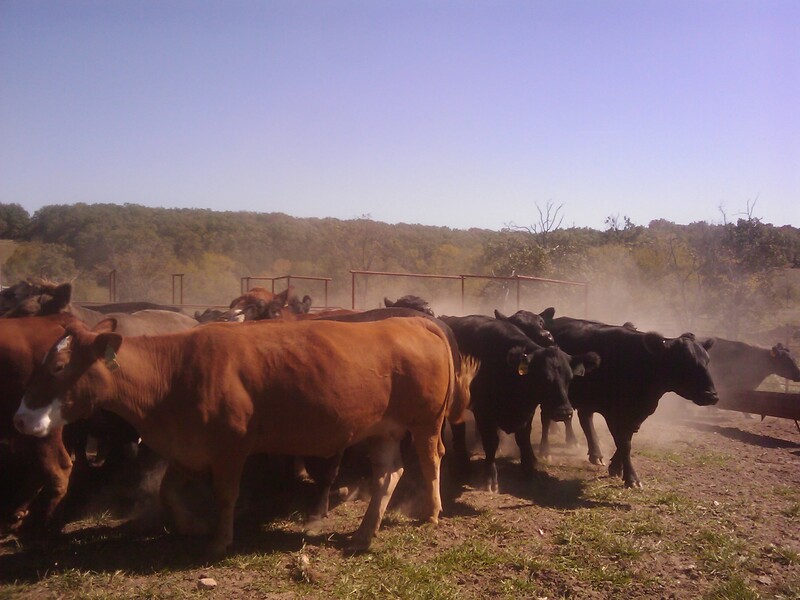 The goal was to get the cows vaccinated and poured. Missing eartags and a couple of toe trim jobs just got postponed. Sure hope the busy people flying over today appreciate the care we ranchers take in raising good beef! I sure did have a great crew of helpers today. And, we paused at the end to think about Daddy Bert. 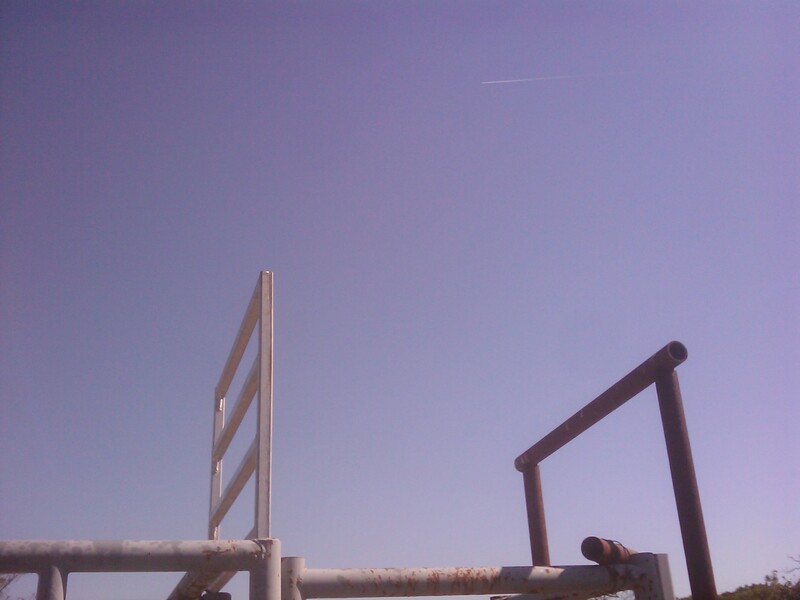 Ole Bert and I used to work cows and calves at this place by ourselves and in temporary patched up fencing and panels. Poor folks have poor ways! I had promised Bert that things would be different. 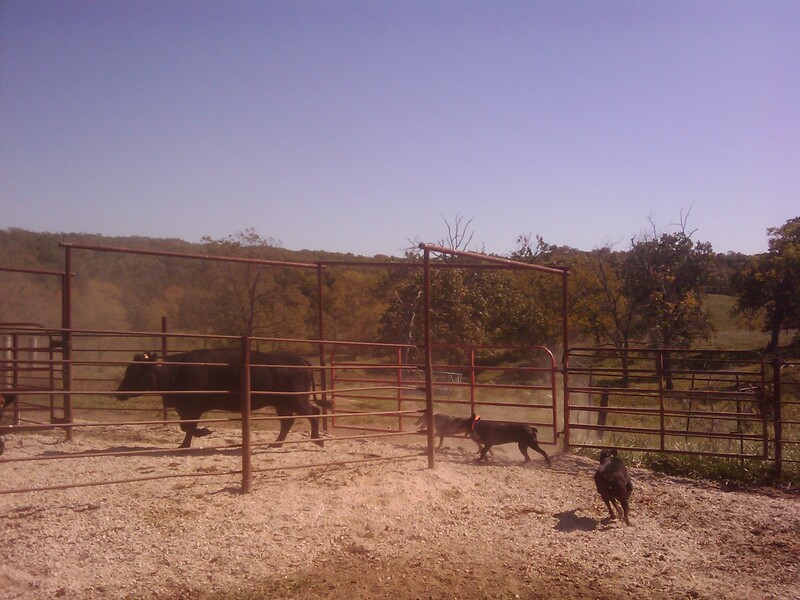 And, he got to work cattle with the permanent pens a few times. He sure loved it…life was much easier. He sure left Hawk and I with some great talent. We told ole Bert we loved him, packed up and headed home to feed the calves in the grow lot and the steers we put out to pasture. It was a good day despite the chute boss goofing up and hurting her hand! At the end of the day, the index finger is wrapped up in betadine gel. The thumb is wrapped up in Sombra Warm Therapy gel and tomorrow I’ll be good as new…well, maybe not! But the Sombra is a ‘miracle medicine’ that sure comes in handy. Even though it is bone dry and dusty here, the one good thing is the temperatures are about 10 degrees below normal and that means we can get some good cattle work days in. 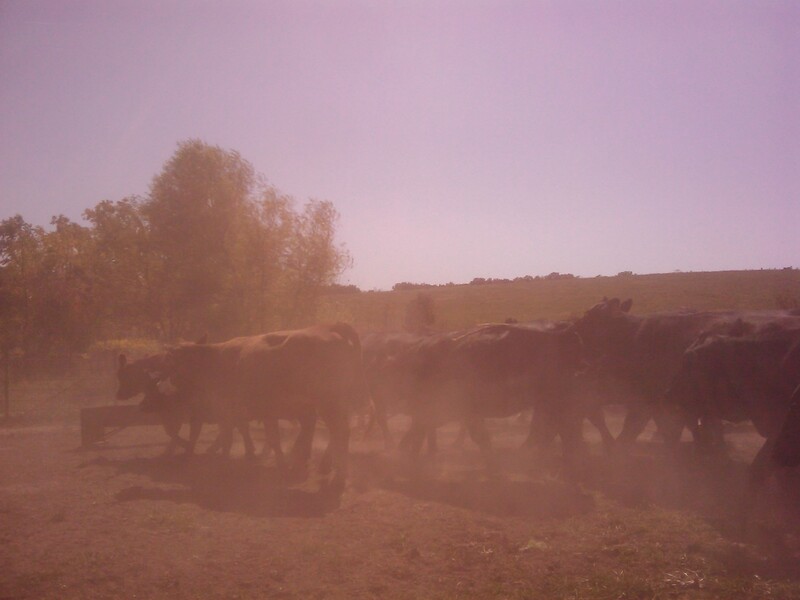 Today the A-Team got to gather 3 sets of cows….the Fall calving pairs and heavies, the yearling replacement heifers and some of the 2011 Spring calving heifers. With the morning being a little crisp the drys and heavies were a little frisky but the pairs were ultra stubborn. But, the cowdogs did a great job of searching the brush, timber and branch. I did have to send them back one time to get a heifer that had held up in a ravine. I just happened to spot the top of her head as she was headed through the cedars. I got the attention of the 4 dogs and told them to ‘look back’ . The race was one to search the cedars and it wasn’t long when they had found the heifer and had her headed back towards the rest of the group on the hill. They didn’t have her on a fast paced run, but she wasn’t looking back either. Problem solved. We gathered all the groups before we started our vaccinating, tagging and deworming. The vaccines for today were Pfizer’s PregGuard 10 FP and Vision Somnus. The deworming was Ivomec pour-on…the last of the horn flies were needing to be ‘rid of today’. The lack of grass has us in a hay feeding situation over the past several weeks. If we could have gotten some rain we could have spread some commercial fertilizer and got a little shot of Fall grass growth. But the key word was ‘if’. It is lining up to be a long feeding winter. 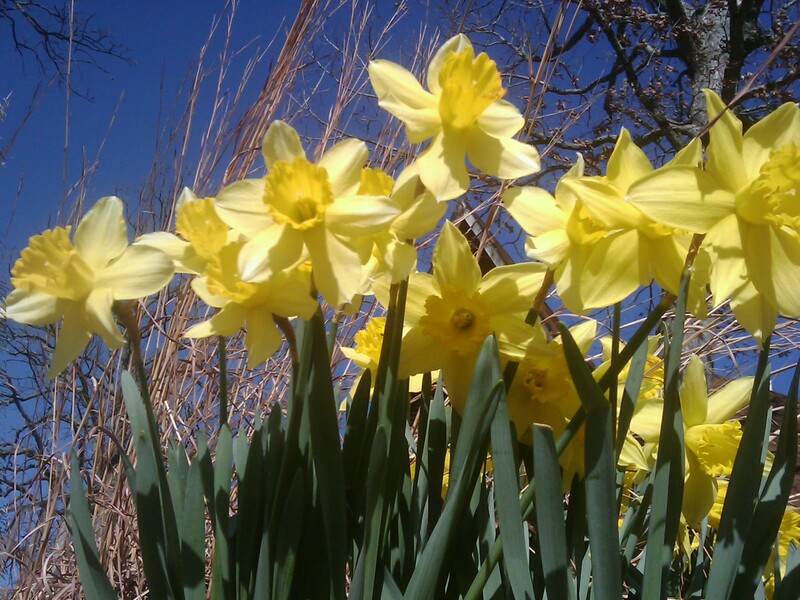 I am just grateful the temperatures have been extremely pleasant. That helps with the mental attitude of the ranch hands and me! The other thing we are adjusting to is the shorter days. It’s getting to be that time of year when you got to be wrapping things up by 3-4 p.m. so that you can be done before dark…or 7. A cattle buyer stopped by today. He was just passing through and seen we were working cattle. 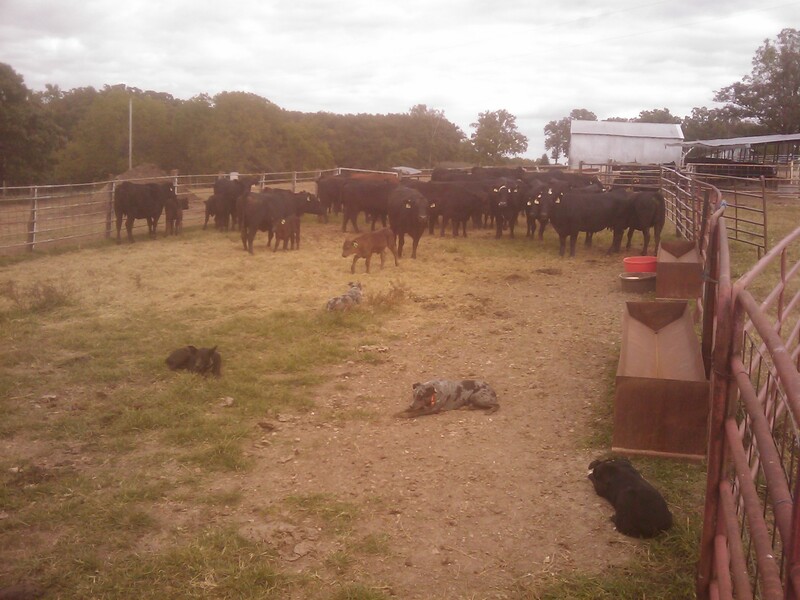 He loves to watch the cowdogs work. Said he was just going to stay a little bit and he was still here 2 hours later. But we all know ‘that is a little bit’ for a cattle buyer! Had to tease him about that. Before he left, he wanted to snap a few pictures. A while later he sent a few of them to me with a caption, “In Need of a Washing Machine!” He must have thought I looked dirty. Just another day at the office. 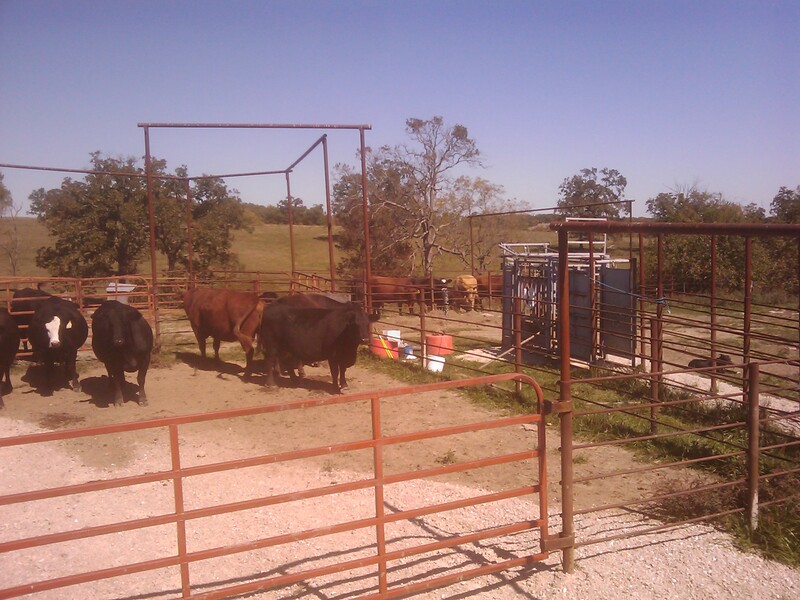 Power Genetics and ABS Global Team Up On Bull Testing…Feed Efficiency Research/Data. Visitors to the PowerLine Bull Center in Arapahoe, NE, will see some new equipment that will move the genetics program to the next level. ABS is installing a GrowSafe system to measure individual feed intake on a portion of the bulls that are performance tested there. GrowSafe is comprised of a series of individual feed bunks where only one animal at a time can eat from each of the individual bunks (called nodes). When an animal sticks its head into the node, the antenna reads the electronic tag number and sends this information to the central computer every second. The scale under each node weighs the feed every second and sends that information to the computer. 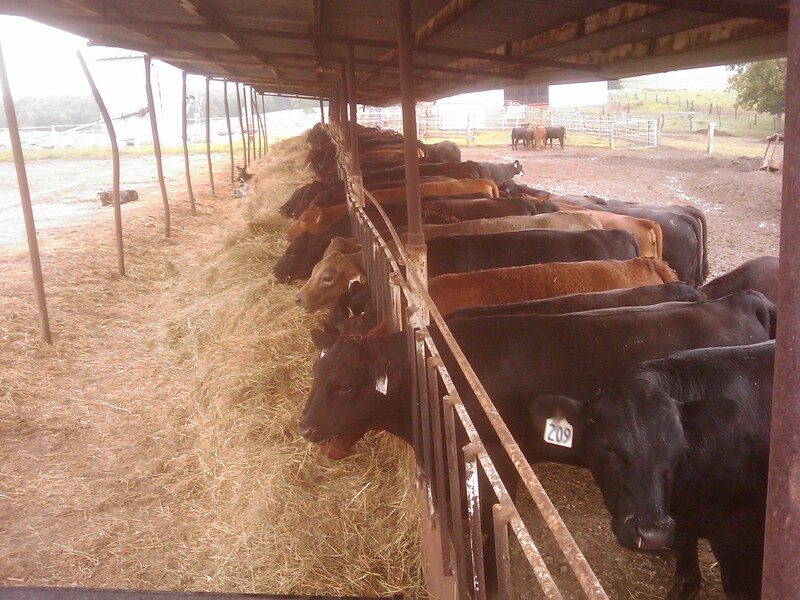 As the animal eats from the bunk, the system measures the amount of feed that disappears. This process goes on 24 hours a day, 7 days a week, for a minimum of 60 days. A massive amount of data is collected. “Ultimately, we’re searching for those individuals that gain more weight on less feed. That information goes into a genetic index that combines all other information to give us an estimate of which bulls are likely to sire more profitable cattle. 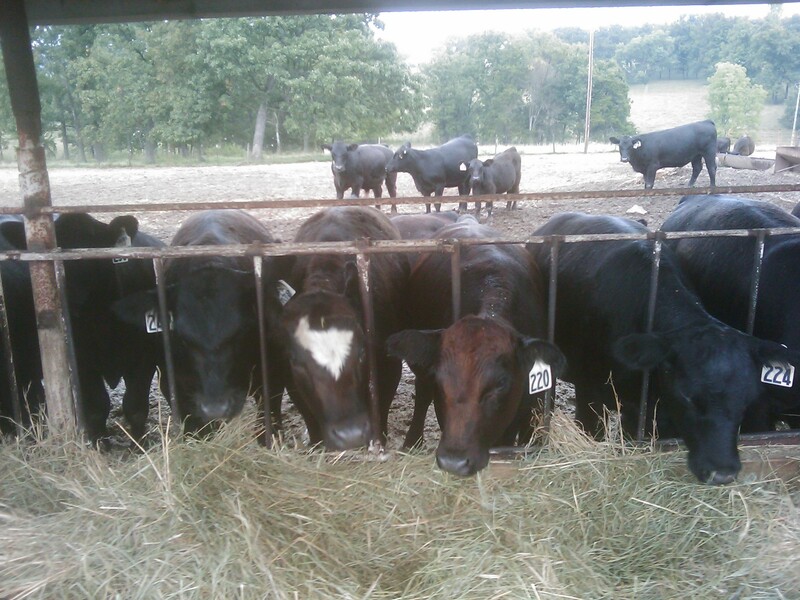 It isn’t cheap or easy, but it is critical to our mission,” said Jeff Berry, ABS Beef Technical Specialist and on-site genetic evaluation manager for the PowerLine Genetics program. GrowSafe is the Cadillac of feed intake measuring systems. It has been used all over the world and is a proven system. As this issue goes to press, December corn futures are over $7 per bushel. A semi-load of corn used to cost $2,000 and now it costs $7,000. 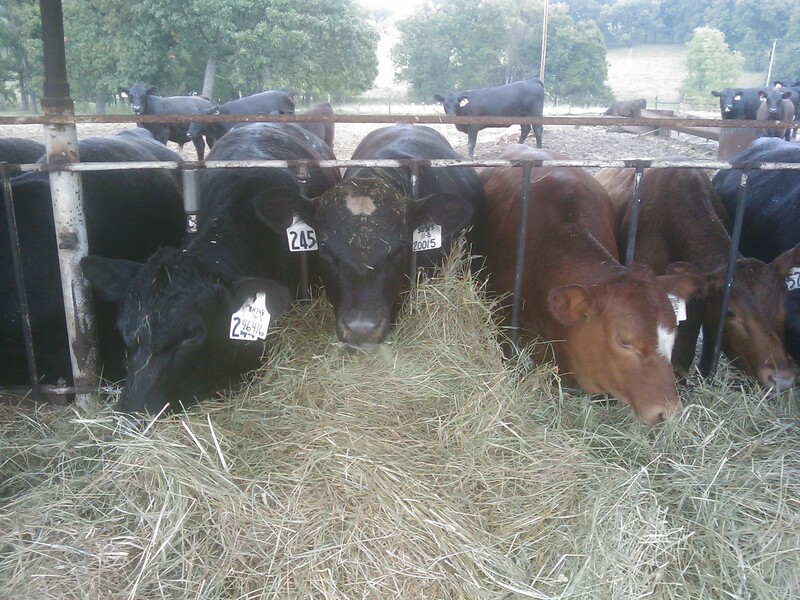 “We have to breed cattle that gain a little more on every pound of corn that they consume,” said Darrell Wilkes, ABS Beef Supply Systems Manager. 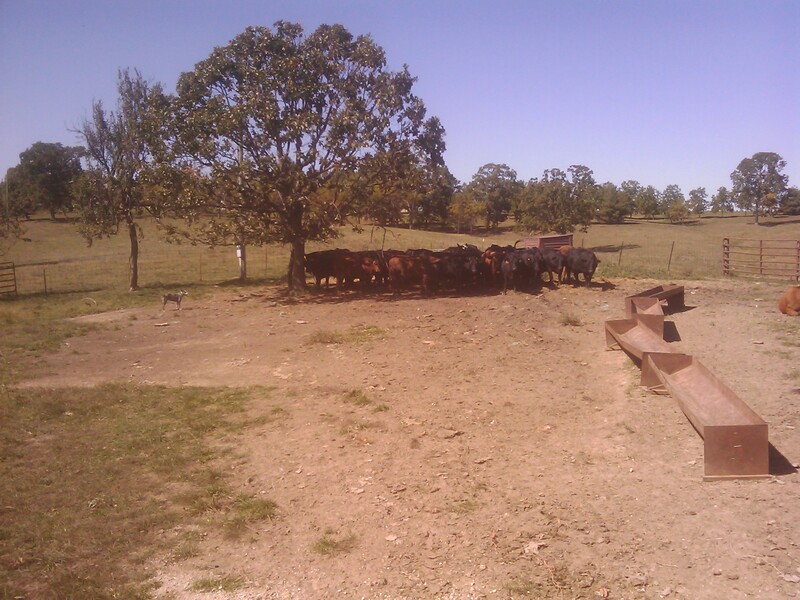 ABS has been gathering feed efficiency data on Angus sires for over 10 years. 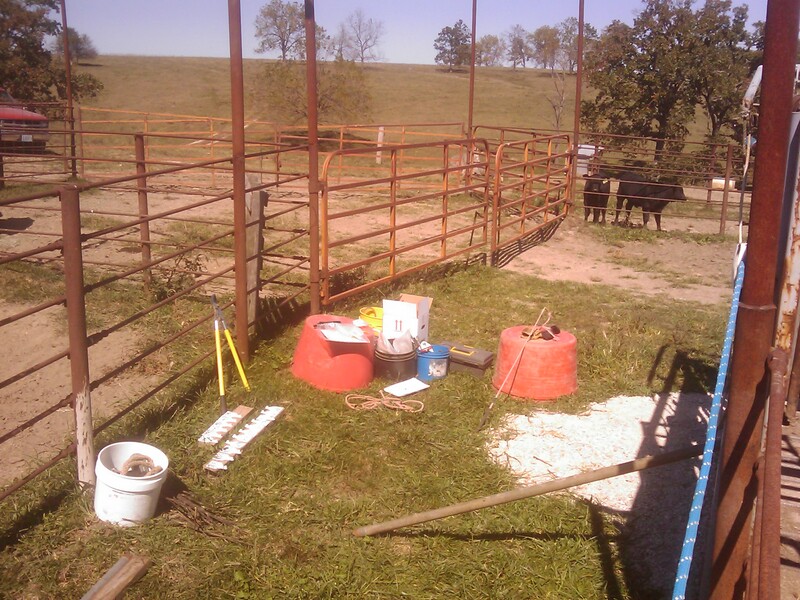 The system being installed at Arapahoe will provide data on Simmental and SimAngus. 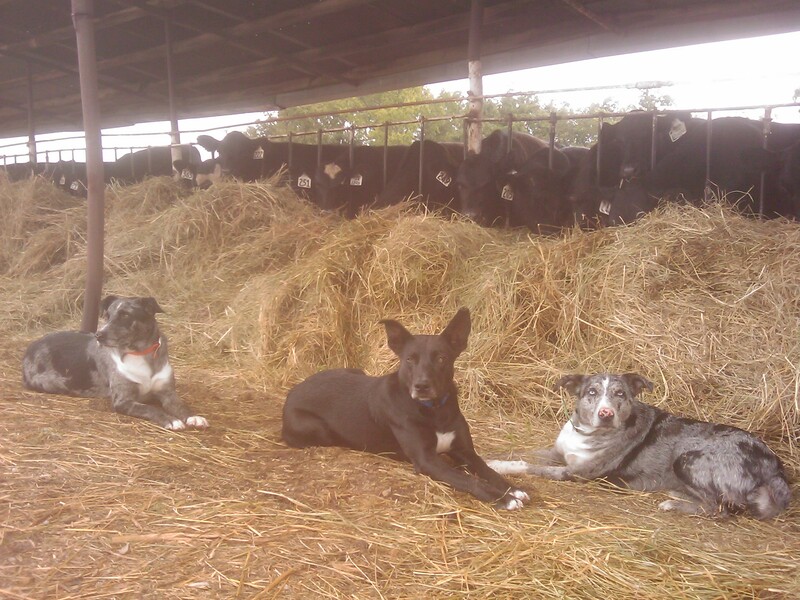 “Then we have what we need to stack pedigrees for efficiency and profitability. This is an exciting time to be involved with genetic improvement of beef cattle,” Wilkes concluded. NOTE: For more information about Power Genetics and this research collaboration with ABS Global…visit www.powergenetics.com. 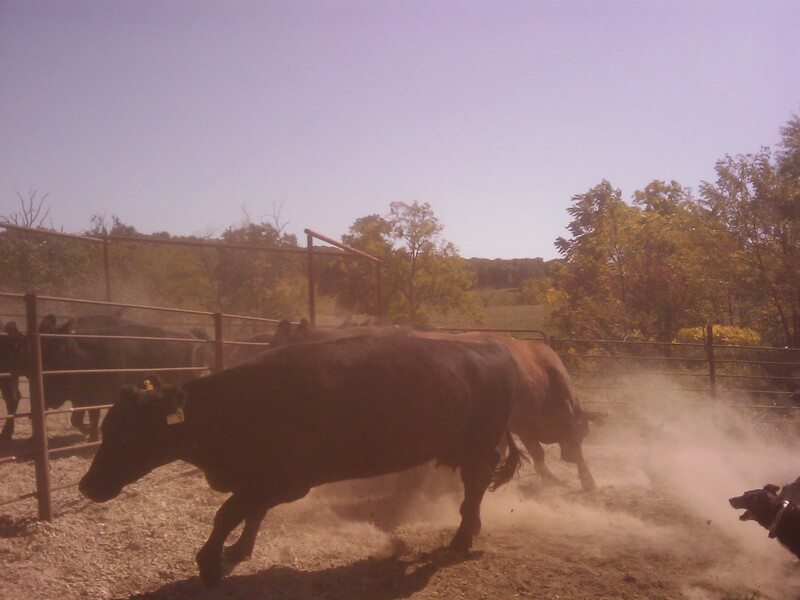 The Fall Bull Sale is this Thursday 09-22-2011 in the morning. See website for information and bull data. 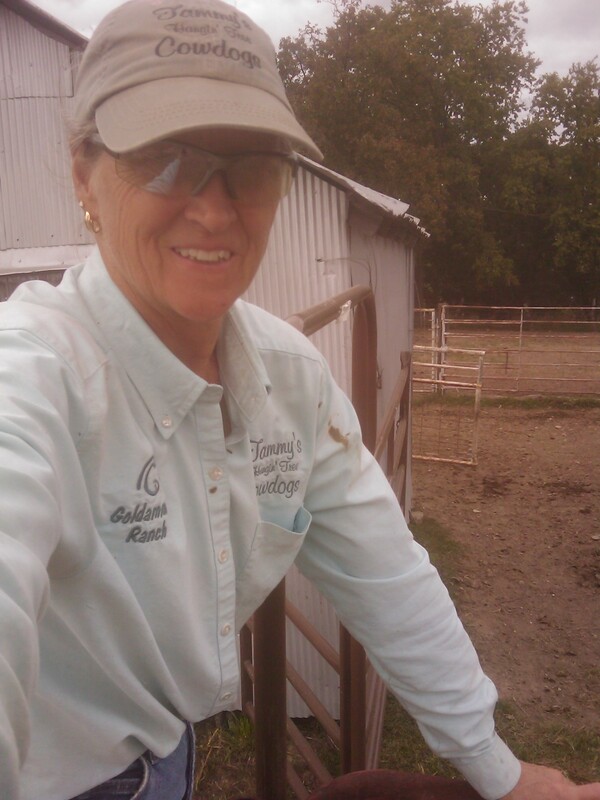 This afternoon I was returning phone calls to people inquiring about cowdogs and pups. One of the messages I replayed several times trying to catch the person’s name. I just couldn’t quite hear it clearly and figured it was just as easy to get on with it and call. The person answered and was glad to hear from me. It was a person that was on the team of doctors that took care of my beloved Bert last year in early September. I was speechless for a significant portion of the call. Even in his afterlife I am finding that Bert inspired many people while he was here with me. It does take my breath away to hear how people were amazed at the undeniable bond Bert and I shared…as this person stated…the obvious love we shared. Atta Boy Bert. Thank you for all you gave me. And, all you left me. After the shocking phone call, part of Bert’s kids and I spent some time under the feed rack roof watching the calves munch away on hay. Hungry little grinders…grow babies, grow! Every one of these calves’ mothers grew up with ole Bert. Many of the calves in the grow lot are from mother’s that were born the year that ole Bert saved my life…Labor Day weekend 2004. 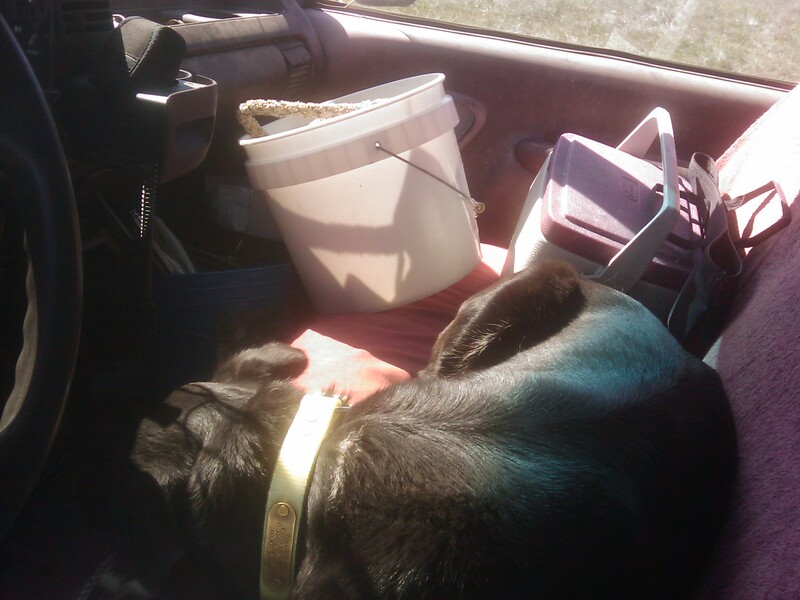 Hawk and Jewel were sacked out in the seat of the pickup and when I told the kids to ‘load up’ Jewel and Hawk came to console me. Gotta hand it to the girls in the front seat, they are very caring…just like ole Bert. Atta Boy Bert…we love and miss you. 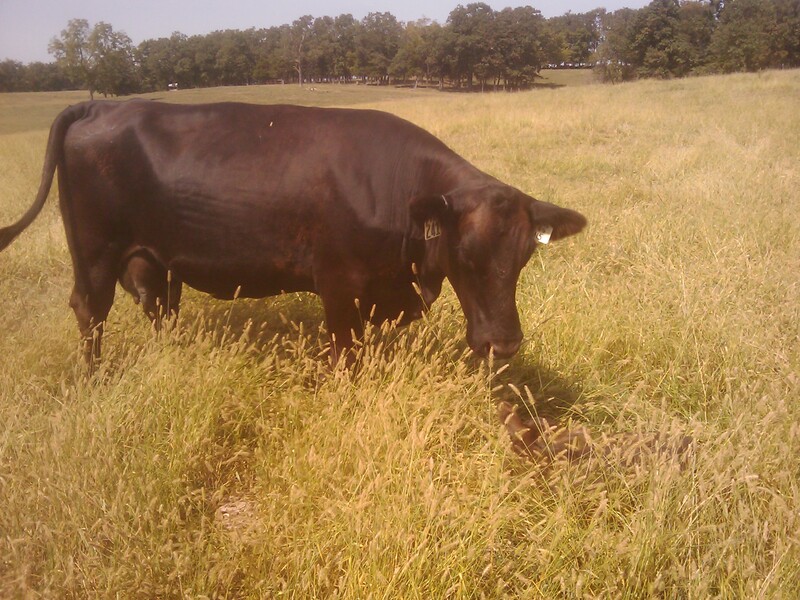 Fall Calving…Hidin’ In The Foxtail. The Fall calves are arriving. 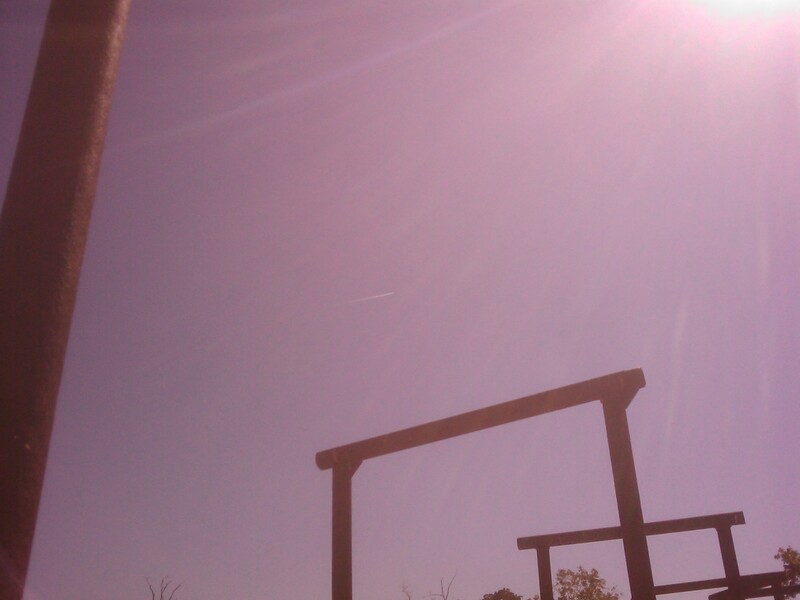 The last two days it has been terribly hot…93-95 degrees. 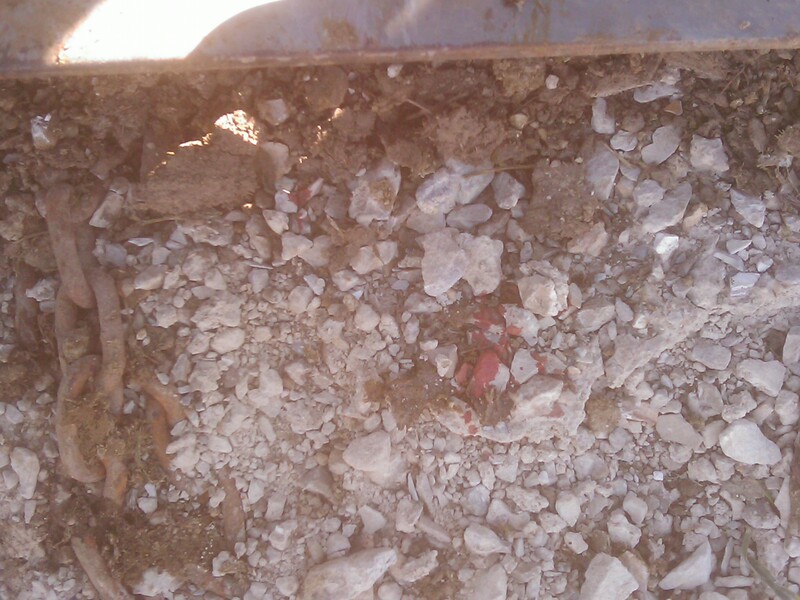 It is bone dry and dusty. With the extremely hot and dry summer the foxtail is a runaway this Fall. Cousin to a weed! But, it does make for some dense cover to the ground and it does give the baby calves some extra ventilation. I headed out with one cowdog (Ducchess) to check the heifers early this afternoon. We had spotted a new calf relocating itself. As we got closer to it, it literally dove into the foxtail and was crawling to bury itself and it tucked its ears as flat to its head as it could…totally hunkered and flat to the ground. It didn’t move a muscle. We stopped nearby and I got down wind to it and tried to get a picture without flushing it out of its hiding spot. We went on to find the calf’s mother. It was really hot and it would be good if she’d come and get it and take it to some shade. Ducchess and I went on and located the cows along a tree line. I gave a little calf beller and a cow responded. She wasn’t too interested…concerned, but not really interested in following. So I had Ducchess come around to the cow’s sight…gave a little beller and the cow became very interested. 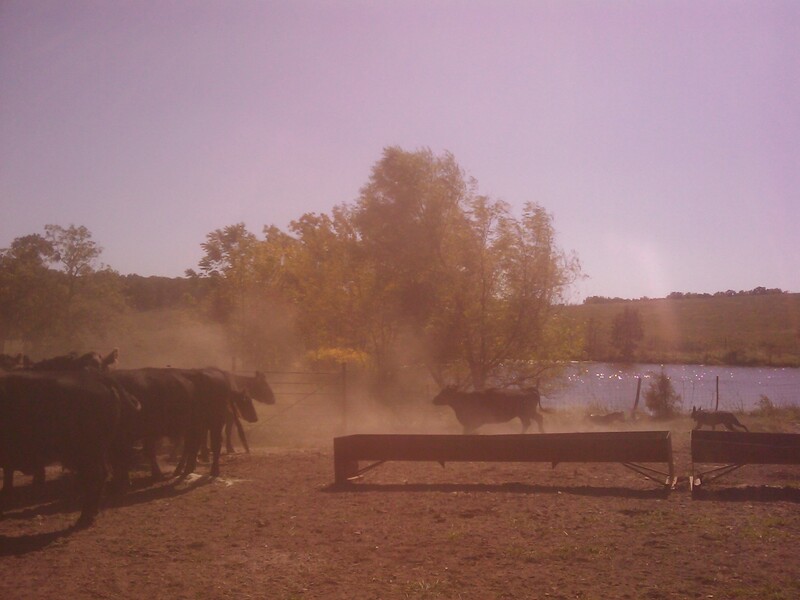 She was off at a trot like a homing pigeon…straight to her calf. Ducchess and I had to take the long way around to cross the ditch. We waited a bit and the calf was not showing an interest in getting up. We drove on up to the pair and the cow gave the calf a different moo sound and the calf responded by lifting its head. A couple more ‘come on’ moo sounds and the calf got up, did a potty number and off they went. Tomorrow the high is to be about 20 degrees less and by Thursday the high is to be the low 60’s. That will be a welcomed change. Kinda looks like we are in for some see-saw temperatures and that can be a blessing and a concern for the calves. If we could get a shot of rain it would sure make things better. Will just have to make sure allergy respiratory issues don’t creep into the calves. 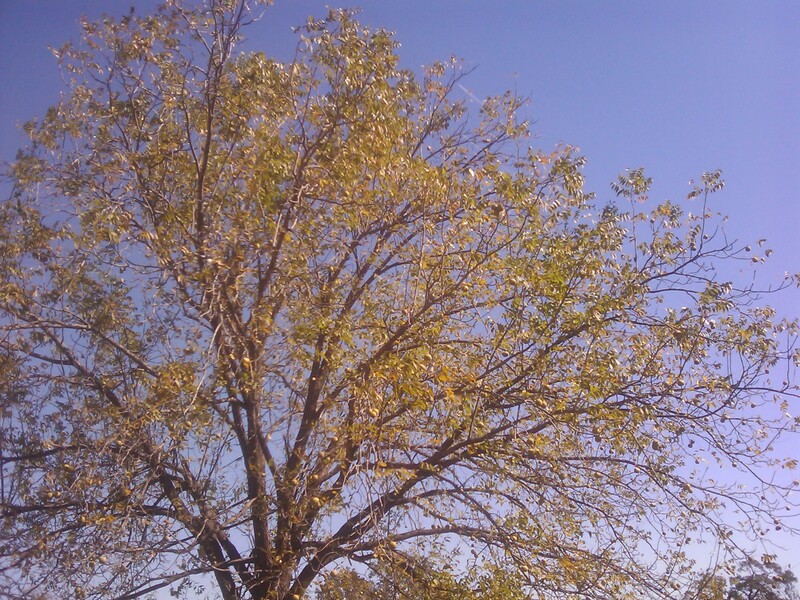 Fall is certainly on the horizon! 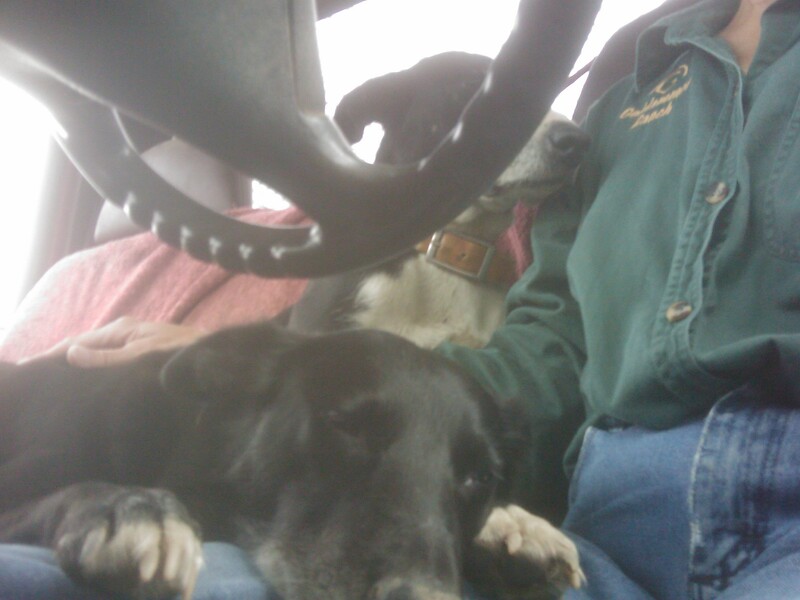 Road trip on Monday (yesterday) to Bolivar, MO destination Countryside Vet Clinic…6 cowdogs – 4 tied on the Hydra Bed rack, 2 in the backseat breathin’ in the AC, 2 bulls to the tilt-chute for corn removal…picked up a 3rd bull at Fair Play…250 miles RT, 10 hrs…good for the cowdogs and we are all glad to be home! Bert and I were out checking cattle at a place several miles from home. I usually never have the radio on in the pickup. But that day as we headed down the mile long lane leaving that farm, I turned on the radio. Expecting some music. But instead of music there was the voice of a national news correspondent. Rare. Rare enough that you immediately know that something of major importance is/has occurred somewhere. I turned it up and after a few minutes could piece together that a plane had flown into a building in New York City. I was about 3 miles from a convenience store that a friend owns. I drove there to see what was on TV. Stunned is how we felt. I headed home and was glued to the radio all the way. And, as we all know now, more was about to unfold. I thought of a young man from SW Nebraska who worked in one of the Towers near the top. His family ranches and is in the banking industry. I had visited his dad’s place and rode around looking at cattle for a whole day with Jack’s son John, who was home for some vacation time. John’s folks had been living through a drought that summer and grass was non-existent. The calves had been weaned early and were fenced along some meadow areas. 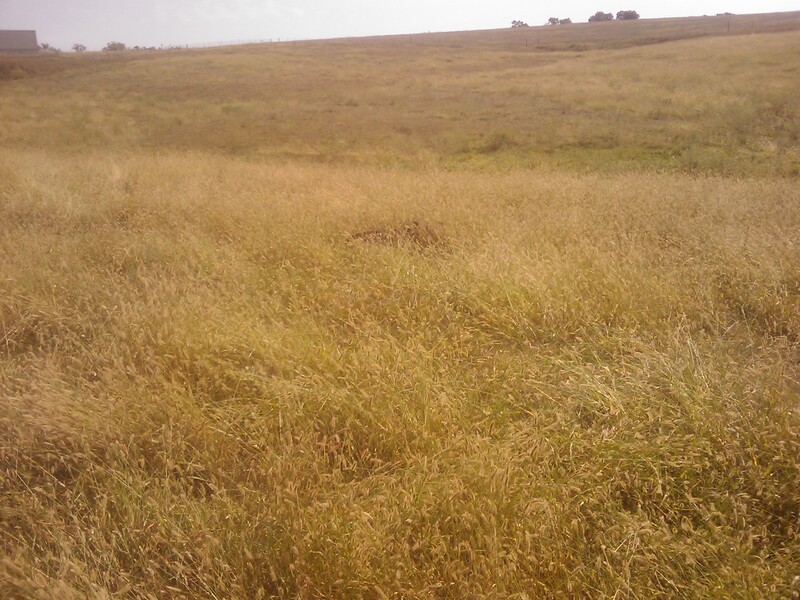 Put there mostly because the meadow soil was less prone to turning into a dust bowl. They bunkfed them a ration and then used the meadow’s edge as a loafing area. I really enjoyed visiting with John that day and he commented he was looking forward to coming home someday to work on the ranch full-time. We had a good time as I told him stories of working cattle at his dad’s place back in the mid-80’s on some of the University’s research testing various new fly tags. A few days after 09-11-01 I got a call telling me that John was okay. In some type of fateful twist, he had left his job in New York City and returned to the ranch to work with his dad. It is amazing how much we can forget about our days and amazing how we can remember some things. Our lives in America sure have changed since the events of 09-11-01. There are a lot of children who had parents disappear from their lives that day. Parents even lost children that day. Life can really change in an instant. We can only hope that God will help us through whatever life brings.